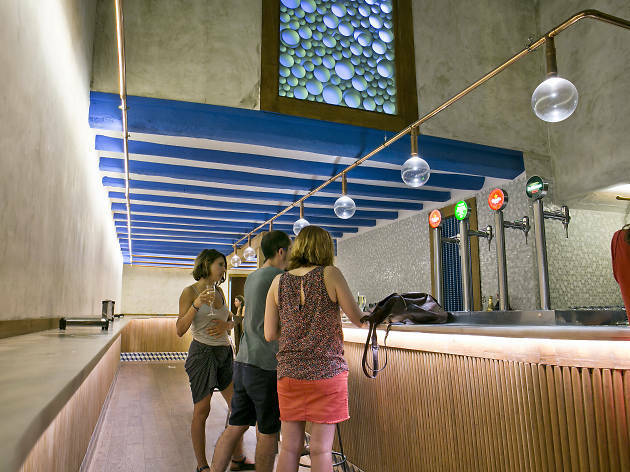 In Barcelona, bars tend not to have very imaginative names. 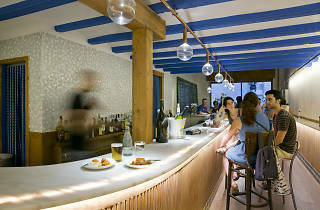 It would be great if someone took the opportunity of opening a new place to call it something like 'The happy cockle' ('L'escopinya alegre'), 'The two-headed dog' ('Els gos de dos caps') or 'The hole in the wall' ('El forat a la paret')! For the time being, however, the custom of naming bars after their location looks set to continue, like in the case of this one that's found in Plaça Raspall, which, fortunately, is one of the prettiest squares in the city, one that's little-known and hasn't been taken over by the crowds. 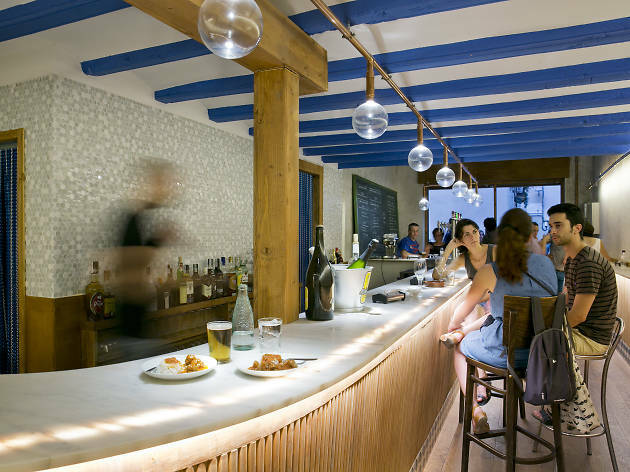 Even so, the Raspall gets a lot of clients every day, drawn particularly by the offer of a free tapa with a glass of small beer ('canya'), wine or vermouth. For €2, you can accompany your drink with: a mini burger with topping, meatballs, potato omelette, tabbouleh, tandoori brochette, vegetable 'cake', hummus, croquettes and I'm going to have to stop there because I'm running out of space! Every evening, local gypsies fill the place as if it was their home, documentary-makers who have their office just opposite, passersby looking for a place to sate their hunger, and anyone who has a radar for finding places with something special to offer. 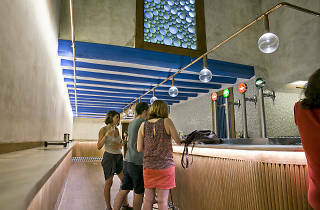 The lights of this bar are made with copper pipes and bulbs of blown glass. The beams, painted blue, hold up the two-level ceiling. At the entrance there's a small bar where smokers can rest their drink; there's also a barrel for the same purpose. The sign at Raspall is made of small beer bottles (you can only see the neck like a green circle), and it's really cool!